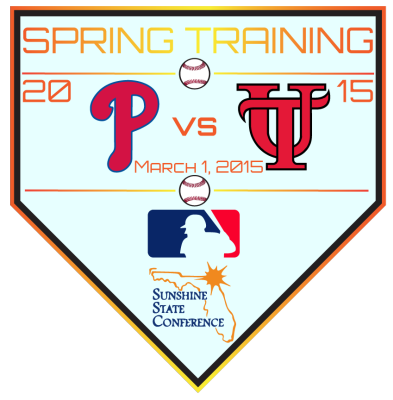 The Philadelphia Phillies will open their 2015 season with a bold, necessary plan. Hamels is right, in most respects at least. He seems to have bought the company line that the team was unaware of what spring training 2015 held in store for them. This is fine, mostly because it’s irrelevant: they’re past the point of no return. That opening game against the University of Tampa (13-1 in 2015) is scheduled for Sunday, March 1, and it isn’t going anywhere. Neither are the Phillies. They effectively are the oldest team in baseball (twenty-ninth in batter age and twenty-ninth in pitcher age), they haven’t been able to comport themselves in public for years, their retirement fund is rapidly depleting, and it’s time to put them out to pasture. The team has been lured to the Greater Tampa Bay Area of Florida, the great dog park in the sky for many an elderly Northeasterner too worn down by harsh winters and the general toils of life, with the promise of a game with some fellow ballplayers they’ve been told are their grandchildren. Their memory isn’t too good these days, but the age difference should be enough to convince them for a few hours, which is all the Phillies really have left anyway. Once that final out is recorded, the team will be put to legal and biological rest, the only terrestrial specter of their long and mostly unsuccessful history remaining in the ethereal form of the Phillie Phanatic haunting Tommy Lasorda up and down the Florida coast. As our way of sending the Phills off like the professional baseball team they technically are, an abridged preview of their first spring training game of this season and last game of their existence follows. This inter-generational matchup promises to be a baseball game. The University of Tampa’s nickname is the Spartans, and they hail from the NCAA Division II’s Sunshine State Conference. Their sports program (which, yes Pat, would like to buy a vowel) includes athletes named Zane Hranac, Lindsay Dring, and Kandi Kuder. On the baseball squad, keep an eye out for third baseman (and son of Ric) Nick Flair and pitcher (and son of Brett) Zac Favre, among others. In an apparent attempt to better understand their elder opponents, the Spartans have brought on redshirt infielder Joe Walsh as a consultant. Two questions on the Phillies side: 1) does anyone besides Hamels know what’s about to happen? and 2) who does their backup catcher root for when Duke and Kentucky play basketball? Expect both teams to be battle-tested. For Philadelphia, you should take the preceding remark literally, as some members of their bullpen served, under various flags, in the Second World War. If there ever was a known quantity in baseball, it’s these Philadelphia Phillies, and we’ve been knowing for a while that something like this needs to happen. Sometimes the only way to go is out. From a holding cell deep below Veterans Stadium, I bid them farewell. Phillies vs Spartans logo by Matthew Kohnhorst, Caught Looking Design.